With their sensibility, expression, form and aesthetics, in their capacity as creators, witnesses, connoisseurs, supervisors and interpreters of changes and developments in contemporary art since mid-20th century, as part of the “ILLUSIONS” exhibition and in their own distinctive ways, artists VOLLRAD KUTCHER and PREDRAG CARANOVIĆ are taking us back to revisit the subject matter and issues of genres in art. A traditional genre in art, the portrait, is an ideal medium for Vollrad Kutcher to explore the themes of identity and human individuality, which he then develops in novel, surprising and temporal forms of expression. 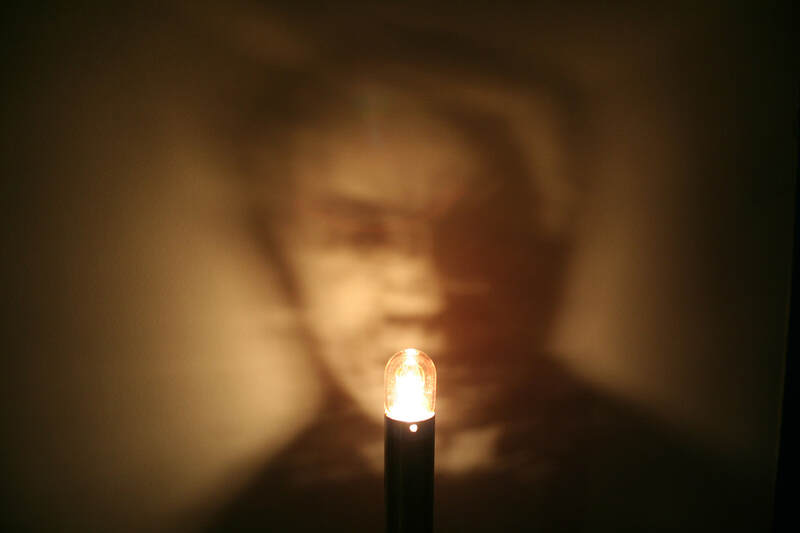 His light portraits – “Shinning Role Models” – are using an ancient technique of anamorphosis, playing with perspective and distortion, whilst light, as a sculptor’s material, assumes the role of so-called illusive images of thoughts which appear in the material world solely as reflections. The artist has presented a series of portraits of individuals whose landmark scientific achievements were a turning point for the history of electricity and development of artificial sources of light. This portrait gallery serves as an extraordinary monument to light and is dedicated to historical characters whose work represents an exceptional contribution to modern science and technology. On the other hand, committed to either exploration, creation or adoption of both the objects of high aesthetic value and those everyday objects which, in his interpretation – through deliberate relocations, selections, layouts and combinations – assembled together, assume a novel or different background for recollection or reading of the history and semantics in question, Predrag Caranović takes advantage of the opportunity to present, under the title and genre of “Still Life”, perhaps for the last time, an object which marked the 20th century. Reminiscence of this period, which made the night shorter and the day longer, ushered in the third shift in people’s lives, and thus, fundamentally, affected one of the most important myths of alternating-night-and-day pattern. This is probably the last chance for such an action since ‘classic’ incandescent light bulbs are on a one-way journey to be consigned to history. This is why the artist has added a subtitle – “From Edison to Recycling”, as a landmark of sorts between the myth of light (20th century) and the myth of recycling (21st century).